Use something on your creation that is inspired by pumpkins. 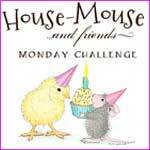 Of course you must use a House Mouse, Happy Hopper or Gruffie to join in. and I do not own any Halloween-like HM image. 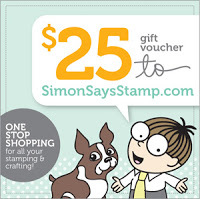 'Mice Decoy', you can find it here at Simon Says Stamp. and there's a little pumpkin charm as well. The papers are from Panduro, a Scandinavian craft shop. and elements from the front. Please hop over to the challenge blog and have a look at the inspiration from the design team. We love to visit and see what you came up with. Dorte, what a fun image. Love that background paper and those little eyes in the black paper. Fun card. Lovely image, Dorte....great papers too! Stunning card and you use a beautiful images! I like all details! Thank you for playing with us at BearlyMineChallenge. Such great creativity. Love your DP, charm and use of Mousey image. Well done on your image choice - that is perfect for Halloween, as are the black and orange colors you used! The pumpkin charm fits perfectly for our theme of "Heavy Metal" too - thank you for sharing your project at Craft Your Passion. 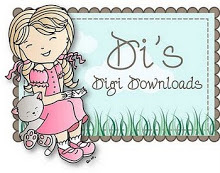 A fabulous card Dorte, I love your design and colours - your image is just adorable and your details are perfect!!! Wonderful card. Thanks for joining us at Fairy Tale. Well for not having any Halloween stamps etc, you rocked this challenge Dorte! Lovely papers too! This is so cute! I love your image too. Thanks for playing along at Seize The Birthday. Such a sweet creation Dot and all beautifully coordinated. Many thanks for joining in at Penny Black and More challenge this month. Cute and sweet! Thank you for joining us at Seize the Birthday. Uanset hvad så er der noget halloween bare over farverne. Og dit søde stempel og lille charms gør jo underværker. Ærgerligt du rendte ind i forkølelse mm på din tur. Men det ville altså også være noget af en tur i sig selv til Fyn - oveni familietamtam. Så nu må du tilrettelægge din næste dk-tur efter conventiondatoerne. Bare at komme og snuse og møde så mange danske papirtosser på en gang er jo stort ! Jeg håber stadig engang at møde dig IRL. Håber du er frisk igen. This is a fabulous card Dorte, such a fun image and lovely rich orange papers. Thank you for making me feel so welcome as GDT at House Mouse & Friends. Your card is so lovely and the image is so funny. Thanks for joining us at the Fairy Tale Challenge. Awww Dorte what a creative image & your choice of DPs is perfect..very clever pumpkin papers..fab colouring great take on the chall theme. thank you for participating in CYP challenge! Rigtig sødt kort og flot motiv du har brugt for at lave et efterårskort. What a simply stunning little ditty and thank you so much for participating in the Really Reasonable Challenge this time too! come back and see us again soon! Fab and fun creation, thanks for joining Penny Black & More @ Allsorts challenge, good luck. Takk for at du scrapper med Papirdokkene. Midway reminder for HM&FMC- and a Blog Hop! 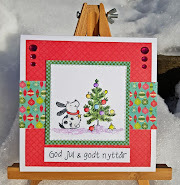 DT card for HM&FMC and a Blog Hop.